Therapist, dance teacher, diver, clown, meditator and more. My main focus since graduating from Oxford University in 1985 had been training and practising as a McTimoney Chiropractor in the UK. I worked as a sole trader in my own successful clinic in Lancashire from 1989 to 2003 and established a patient base of around 400, treating an average of 40 people per week. I have experience of business management and of being an employer. I have also developed other skills: teaching dance since 1990, and in 2002 I qualified as a scuba diving instructor both with the British Sub-Aqua Club and the Professional Association of Diving Instructors. 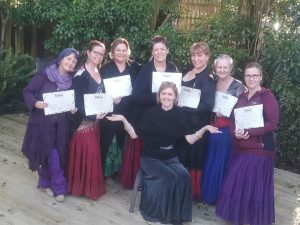 I moved to New Zealand in 2003 and have set up a succesful business as a McTimoney & CranioSacral Therapist in Whitianga, as well as teaching Gypsy Caravan Tribal Bellydance up to intermediate level. I have taken part in whale rescues, having trained as a marine mammal medic and enjoy community activities such as clowning. I lead a busy life and thrive on challenges, while remaining calm and centred with the help of daily transcendental meditation. I continue with further training as I feel it is important to carry on learning and developing in life. 1979 . 9 GCSE ‘O’ levels in English Language, Literature, Mathematics, Physics, Chemistry, French, Russian, Latin and History. 1981. 4 GCSE ‘A’ levels in Mathematics, Further Mathematics, Physics and General Studies. I have many other qualifications in boat handling, first aid, nitrox, oxygen administration, marine radio etc which I can provide more details of on request. I became a citizen of New Zealand in 2007. Driving licence: Full UK and NZ for car and motorbike. Interests: Diving, dancing, music, walking, vegan food, meditation, clowning, steampunk and travel. This site is still under construction and probably always will be as the universe is in a constant state of change!